Side 1 printed with 2 PMS colors and 1 debossed area. 24pt C1S Semi-Gloss stock coated with Aqueous Matte. H4 business card slits on both pockets. 1" metal rings. 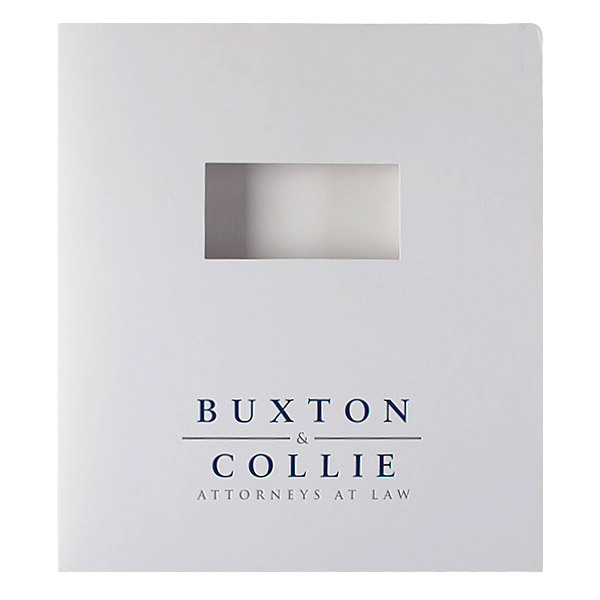 Attorneys Buxton & Collie promote order and clarity with this blue, white, and gray design. Slender serif text greets clients with a respectable, professional foot forward. The 4" x 2" window allows them to read the information printed on their file's title page. Two blue pockets add color and depth to the interior, in addition to matching the blue bar on the back panel where the firm's contact information is located. A gray spine with white text and a blue accent distinguishes this design on even the most crowded shelf. 2 PMS colors printed on Side 1 of 20pt C1S White Semi-Gloss stock. Coated with Matte Lamination. 3/4" metal rings. 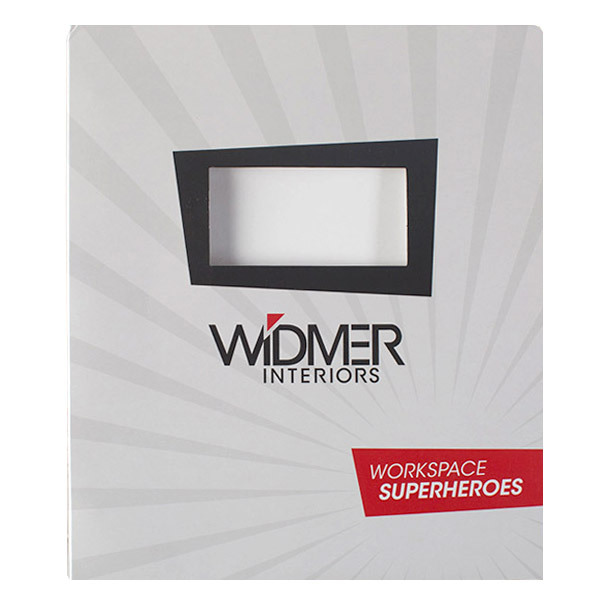 Widmer Interiors salutes classic comic book culture with radial gray spokes and off-kilter "dialogue" boxes reminiscent of a fight scene. The red box around the brand's superhero-inspired mission statement and the red triangle in its logo add a punch of energy. A black box bordering the 4" x 2" window emphasizes the title page, introducing recipients to the contents clasped in the 3/4" metal rings. Red pockets jazz up the interior, while the stark white-on-black rear panel terminates the design with a suspenseful yet classy color scheme. Side 1 printed with 2 PMS colors using heavy coverage. 20pt C1S White Semi-Gloss stock coated with Plastic Matte Lamination. H4 business card slits on both pockets. 1/2" metal rings. Trucking consulting bureau All About Trucks helps clients stay organized with this binder. Dark and light red stripes make for a clean, attractive exterior. A slender sans serif font clearly labels the contents; its color helps the design feel light and airy, alluding to the possibilities of the open road. Contact information on the back lets clients reach out to the firm with any questions about their files. Measuring 4" x 2", a die-cut window gives audiences a glimpse into this item's contents. Multiple storage methods make the interior perfect for carrying all types of 8 1/2" x 11" documents. A metal binding mechanism comes with 1/2", 3/4", 1", or 1 1/2" rings to accommodate varying amounts of paper. The left and right pockets hold extra papers on either side of the rings, making the right pocket a surprise at the end of the packet. Both pockets are v-split to stay clear of the binder rings.